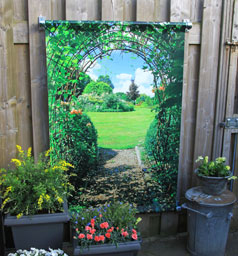 The canvas garden posters without any hanging system are available up till 6 metres wide and 2 metres high or vice versa! 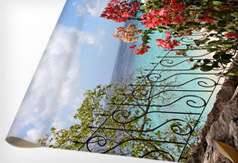 The canvas garden poster is supplied with stainless steel eyelets on all sides. The canvas is easy to attach by using elastics or screws. The size of the canvas will determine the amount of eyelets. If you desire more eyelets, please let us know. Available up till 10 meters wide and 4 meters high or vice versa! 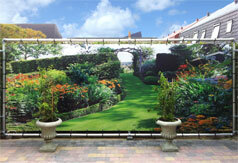 For this mounting system the canvas garden poster is supplied with tulle on both sides. You can fasten the canvas garden poster to the wall by fixing f.e. around stick or a batten through the loop attached to the poster. 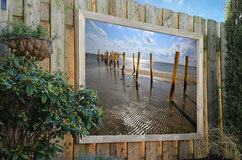 The canvas garden poster is mounted over a wooden frame. 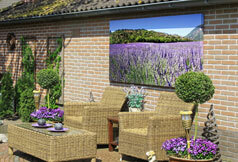 The canvas garden poster is stretched in such a way that the mounting system is invisible. 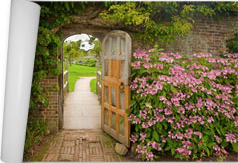 A canvas garden poster with a robust mounting system is easy to mount and has a sturdy look, because of the solid tube construction. 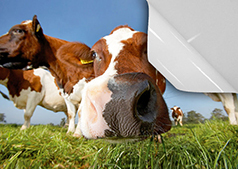 This mounting system is supplied with stainless steel eyelets and aluminium tubes. 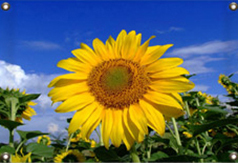 A self adhesive canvas garden poster can be sticked to all kinds of smooth surfaces, painted surfaces, wood, glass, metal and plastic. Maximum dimensions are 1,55m x 6m and vice versa. This self adhesive canvas garden poster is unique in Spain. Easy to attach. Even when you attach the canvas incorrectly, you can easily remove the cloth and reposition it.